For parents wanting to monitor additional rooms or children in their house there's the Summer Infant Extra Video Camera. Keep an eye on your child wherever they are. 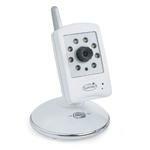 For parents wanting to monitor additional rooms or children in their house theres the Summer Infant Extra Video Camera. Keep an eye on your child wherever they are.